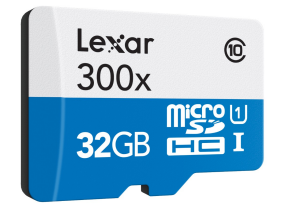 Lexar® High-Performance 300x microSDHC™/microSDXC™ UHS-I cards make it easy to quickly capture, play back, and transfer 1080p full-HD, 3D, and 4K video, as well as the highest-quality movies, photos, and songs. The cards leverage UHS-I technology to deliver Class 10 performance up to 45MB/s (300x), and include an SD adapter for easy file transfer. 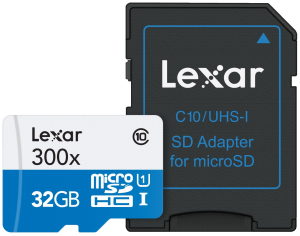 Designed for use with your tablet, sports camcorder, or smartphone, Lexar® High-Performance 300x microSDHC™/microSDXC™ UHS-I cards make it easy to quickly capture, play back, and transfer all your favorite media files, including videos, the highest-quality movies, photos, and songs. Speed rated at Class 10, Lexar® High-Performance 300x microSDHC™/microSDXC™ UHS-I cards leverage UHS-I technology to deliver a transfer speed up to 45MB/s (300x),* giving you the speed and space you need to enjoy more of your favorite multimedia on the go. Cards also include an SD adapter to easily transfer files between your devices. Iscriviti alla nostra newsletter per essere sempre aggiornato su offerte e promozioni. Per avere altre notizie sulla nostra politica di privacy e sui cookies, vedi la nostra pagina per la privacy.